If you would like to understand more about our formulation, visit our website. With vitamin D to support the normal function of the immune system. Enriched with Iron to support normal cognitive development. Our unique patented blend of Galacto and Fructo - oligosaccharides. Ask your healthcare professional about how Growing Up Milk can help meet your toddler's dietary needs. New packaging design on our 200ml and 1ltr liquid Follow On Milk and Growing Up Milk formulations. There has been no change in formulation in these liquids products. 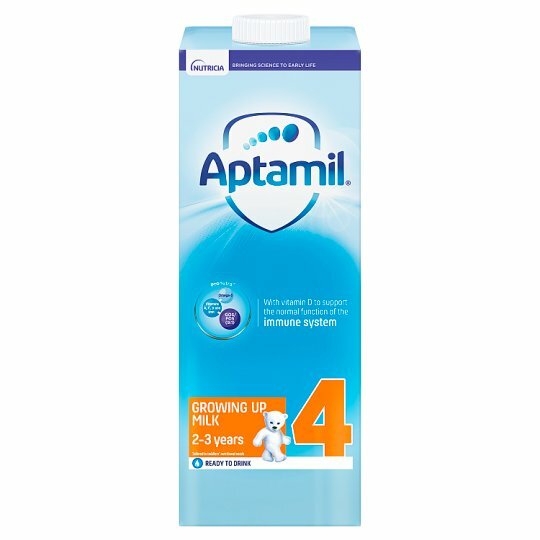 Based on 40 years of research in early life science, Aptamil® Growing Up Milks with Pronutra™ are tailored to support your toddler's development and contain vitamin D to support the normal function of the immune system. We recommend giving your toddler about 2 x 150ml beakers of Aptamil® Growing Up Milk a day, as part of a varied balanced diet. Aptamil Growing Up milk is specially formulated to help meet the increased nutritional needs of toddlers from 2 years onwards. 1 Shake the carton of Aptamil® Growing Up Milk before opening. 2 Pour the required amount of milk into a clean beaker. 3 Aptamil® Growing Up Milk can be given at room temperature or warmed if desired. If warmed, check temperature of drink. 4 For hygiene reasons, discard unfinished milk in the beaker as soon as possible and always within 2 hours. Do not heat drinks in a microwave, hot spots may occur and cause scalding. Toddlers should be supervised at all times when feeding. This product should reach you in perfect condition. If it is not satisfactory, please contact us. This guarantee does not affect your statutory rights as a consumer. Dental advice Do not allow prolonged or frequent contact of drinks with your toddler's teeth as this increases the risk of tooth decay. Ask your healthcare professional or dentist for advice.